The College World Series is college baseball’s holy grail of sorts, the ultimate tournament to prove which team in the nation is that year’s best. Played in Omaha, Nebraska since 1950, the CWS is what every major college baseball program dreams of—a fitting postseason to payoff the season’s hard work. 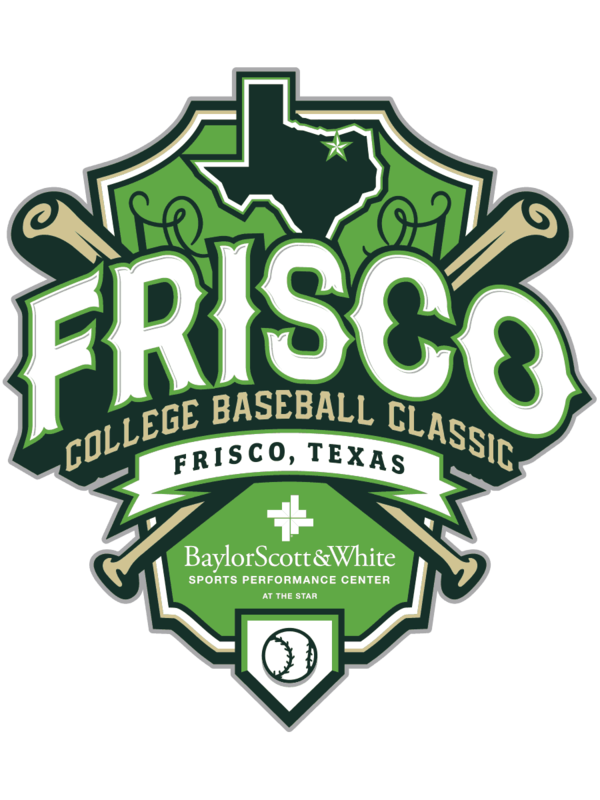 The Frisco College Baseball Classic is similar in structure to the CWS, and can be considered an early season version of the Omaha classic. What you get to see in the friendly confines of Dr. Pepper Ballpark are four top teams starting off their seasons with a playoff-level intensity that prior to last year, was unmatched outside of Omaha. We have your preview of the teams, the schedule, and even the food. Who’s playing in the 2018 Frisco College Baseball Classic? Here’s a quick look at the 2018 teams that will be looking to win the tournament with the right to name themselves the #BestOutsideOfOmaha. Coming into the Frisco Classic, the Aggies are the only team of the four ranked in the nation’s Top 25 (10th). And the top-ten ranking should come as no surprise as they are fresh off a 2017 College World Series appearance, where they were eliminated after two tough losses to Louisville, followed by TCU. The 2018 team has lost last year’s top starter, RHP Brigham Hill, as well as their closer-turned-starter Corbin Martin. Hill was drafted in the fifth-round by the Washington Nationals, with Martin becoming a second-round selection by the Houston Astros. Replacing the aforementioned one-two pitching punch this season is RHP Stephen Kolek, who made 16 starts last year with a nice 3.79 ERA and an 82:24 K:BB ratio, followed by workhorse LHP Kaylor Chafin who produced a sterling 2.33 ERA with an excellent 72:16 K:BB ratio. Add to the mix the heavy hitting Braden Shewmake (.328, 11 HRs, 69 RBI), who slides from second to shortstop this season, and no one would be surprised if the Aggies make it back to the CWS in 2018. The 2017 Baylor Bears could flat-out rake. As a team, they finished second in the Big 12 with a .295 batting average, thanks in no small part to 1B Aaron Dodson (.344, 11 HRs, 42 RBI), and C Matt Menard (.313, 3 HRs, 28 RBI), both of whom were four-year starters, and now graduates. But the Bears have plenty of hitting once again this season, as catcher Shea Langeliers (of Keller), a pre-season All-American, will look to build on his outstanding freshmen season where he hit .313 with 10 HRs and 38 RBI. 3B Davis Wendzel (.301, 8 HRs, 30 RBI) is another key contributor that no opposing pitcher is too excited to face. The problem for Baylor is in starting pitching. Last year, as excellent as their hitting was, their pitching was nearly as bad, as they allowed over four walks per nine innings (4.56 BB/9), and they lost their best starting pitcher in Montana Parsons (3.06 ERA, 71 strikeouts) who was drafted by the Miami Marlins in the 24th round of the MLB Draft. The Bears bullpen, with returning closer Troy Montemayor (2.10 ERA, 12 Saves), an All-American last season, is a strength, but the question will be if Baylor can get enough quality innings from their starters to not overtax their bullpen. The California Golden Bears have a rich baseball history. They first fielded a baseball team in 1892, and have won two National Championships; their first coming in 1947, and their second in 1957. Over the last decade, however, the Golden Bears of baseball have been a team of survival, one that was saved from extinction by a $10 million dollar fundraising effort in 2011. Thanks in no small part to donations from their biggest rival, Stanford, California continued on under coach David Esquer, where they made it to the College World Series in 2011, and the NCAA Regionals in 2015. Now under new head coach, Mike Neu, an appropriately named former pitching coach, the Golden Bears are poised to return to their winning ways. Neu gets the benefit of last year’s entire starting rotation returning, as well as two Freshmen All-Americans back in the lineup in SS Cameron Eden (.315, 6 HRs, 24 RBI) and slugging 1B Andrew Vaughn (.349, 12 HRs, 50 RBI). Obviously, we don’t get too many chances to catch a storied West Coast baseball team in Frisco, so I’d look for all of Cal’s games to be the hottest ticket of the tournament. Bulldogs Head Coach Lane Burroughs did a fine job last year in his first season at the helm. This year, for better or worse, he has an almost clean slate with which to work as last year’s squad graduated 15 seniors. All told, there are 26 players new to the team. Senior leadership, although admittedly thin, will come in the form of two of last year’s key relievers. RHP Graham Ahlrich (4-2, 3.19 ERA, 8.8 K/9) and fellow right-hander, Kent Hasler (5-3, 3.99 ERA, 8.6 K/9) will put out fires as well as help this young squad assimilate and get used to baseball at the Division I level. Offensively, the Bulldogs will find it difficult to replace catcher Brent Diaz (.332, 9 HRs, 48 RBI), a junior who was drafted by the Milwaukee Brewers in the 29th round. Senior Raphael Gladu (.378, 8 HRs, 55 RBI) is off to pursue big league dreams as well, as he was taken in the 16th round by the New York Mets. Despite such tough losses, Louisiana Tech should still put up a fight for contention in C-USA this season, thanks to a young, speedy team that is going to fully focus on small ball as opposed to last year’s squad full of sluggers. Where can I learn more about this event? Visit the event website or follow on Facebook for updates about what’s happening all weekend. Baseball and excellent food go hand in hand, like peanut butter and chocolate, or something like that. The food is going to be awesome, and even awesome food tastes better when consumed at a baseball game. That’s just science. If you’ll be in town for a few days and looking for a list of great restaurants, look no further. Absolutely; in fact, they might not ever forgive you if you don’t. Serious/NotSerious. It’s all about Fan Fest, which is open two hours prior to first pitch each day. There will be giant inflatables, a mechanical bull, and live DJ! And the best part…it’s FREE. Who is going to win this tournament?